string(1093) "Resource Centre > Uncategorized > Transparency Snapshot: A Pilot Benchmark Report"
Today, governments are increasingly taking action by establishing regulations that require companies to disclose information on their approaches to eradicating forced labor from their supply chains, including the California Transparency in Supply Chains Act (SB 657), and the more recent UK Modern Slavery Act. Many companies are acting in response to and anticipation of government requirements, adopting policies and programs to mitigate the risk of forced labor in their supply chains. Yet little is known about which companies are leading the way in forced labor policy and practice and where further efforts need to be made. 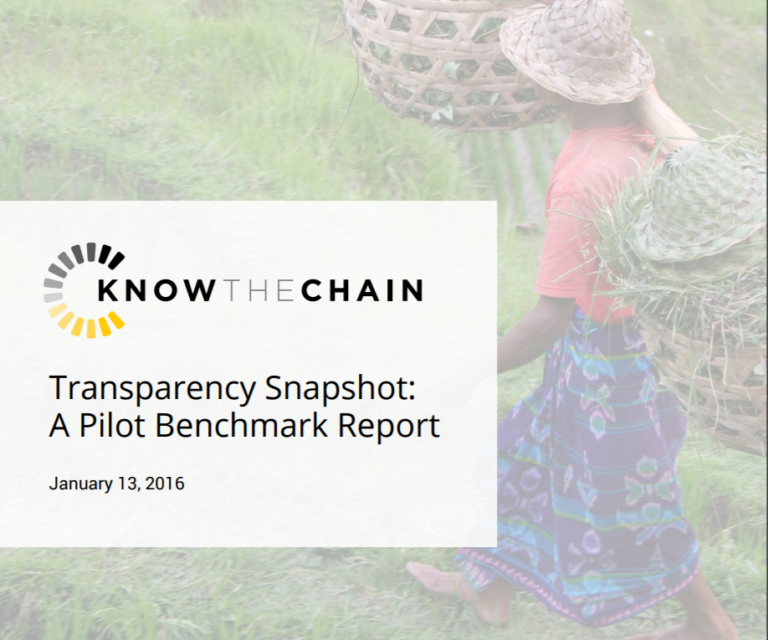 This report presents the outcome of a pilot benchmark conducted in 2015. It examined the transparency and disclosure statements of a small subset of companies with regards to human trafficking and forced labor.